Michelle Ye (葉璇) is not holding anything back when it comes to her fashion stylist boyfriend, Mr. Little Mo (小默先生). Ever since confirming their relationship in June, Michelle has showed no qualms about taking her romance to the public. The couple have been spotted on comfortable dates in the last two months. Michelle and Mr. Little Mo even kissed in public. Their high-profile relationship continues to be of interest for many fans. Recently, Michelle and Mr. Little Mo went to watch an ice show in Shanghai. After entering the venue, the couple immediately snuggled against each other and hugged intimately. As the venue was cold, Mr. Little Mo constantly rubbed against Michelle’s bare arms to keep her warm. 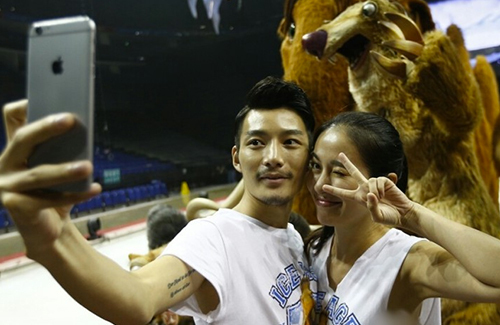 When the show ended, the couple went on stage to take a selfie together with the characters of Ice Age. Michelle confirmed her relationship with Mr. Little Mo in June, when the two were spotted kissing in the streets by the paparazzi. A month later, Michelle went on a talk show to gush about her new boyfriend, calling him the perfect man.